Quilt like a Pro at home! 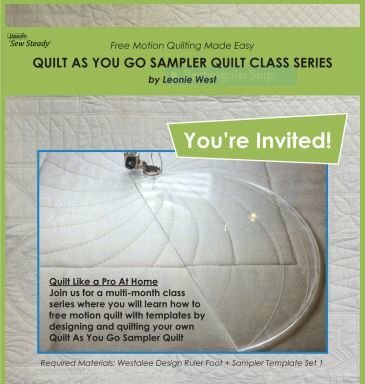 Join us for multi-month class series where you will learn how to free motion quilt with templates by designing and quilting your own Quilt as You Go Sampler Quilt! Once you register, you will receive a USB drive with all of the video's and student guide. Linda Visnaw will be teaching the class each month, but you will also be able to work at your own pace. Need to miss a class? No problem because your video and instructions for all of the classes are on the USB drive. Cost of each class is $25 + supplies; cost of the USB packet is $35. A Westalee/Sew Steady Ruler Foot and the Sampler Template Set are also required. (If you have been participating in Linda's ongoing monthly ruler/template classes, you already have the foot and template set).